Performers include: Dianna Agron, Chris Colfer, Jessalyn Gilsig, Jane Lynch, Jayma Mays, Kevin McHale, Lea Michele, Cory Monteith, Matthew Morrison, Amber Riley, Mark Salling, Jenna Ushkowitz, Naya Rivera, Ben Bledsoe, Patrick Gallagher, Iqbal Theba, Aaron Hendry, Josh Sussman, Jennifer Aspen, Ken Choi, Dijon Talton, Harry Shum Jr. Kent Avenido, Earlene Davis, David Pearl, and Norma Jean Riddick. The Glee Club at McKinley High School used to be at the top of the show choir world but, after a series of scandals, it’s now become an unpopular haven for social outcasts. Optimistic teacher Will Schuester (Matthew Morrison) pleads with the principal to let him take over teaching the group, to try to return the club to its former glory. It’s a tall order when the brightest stars of the pitch-imperfect club include Kurt (Chris Colfer), a nerdy soprano with a flair for the dramatic; Mercedes (Amber Riley), a dynamic diva-in-training who refuses to sing back-up; Arty (Kevin McHale), a geeky guitarist who is confined to a wheelchair; and Tina (Jenna Ushkowitz), an awkward girl who needs to suppress her stutter before she can take center stage. Will’s only hope lies with two true talents. Rachel Berry (Lea Michele) is a perfectionist who is convinced that show choir is her ticket to stardom. Finn Hudson (Cory Monteith) is a popular high school quarterback with movie star looks and a Motown voice. While he enjoys singing, he feels like he needs to hide his interest from his holier-than-thou girlfriend, Quinn (Dianna Agron), and his arrogant teammate, Puck (Mark Salling). Driven by his secret past, Will is determined to do whatever it takes to make Glee great again, even though everyone around him thinks he’s crazy. He’s out to prove them all wrong — including his self-centered, craft-obsessed wife, Terri (Jessalyn Gilsig), and McKinley’s dour cheerleading coach, Sue Sylvester (Jane Lynch). The one person who believes in Will is Emma Pillsbury (Jayma Mays), the school’s guidance counselor who has a secret crush on idealistic Will. The finale opens with New Directions winning Nationals once again. As a result, McKinley is converted into a performing arts school and Will is named as principal. He expands the show choir to create other vocal groups and appoints Sam as the New Directions coach. The original New Directions alumni gather for a final time to say goodbye to both the school and to each other. Mercedes announces that she has been chosen as the opening act for Beyoncé’s world tour. Kurt and Blaine find Sue in Will’s office and they thank her for getting them back together. She thanks Kurt for all she learned from watching him, then makes up with Becky, and sings a song to thank and say goodbye to Will. Flash forward five years and we find Vice President Sue Sylvester talking to Geraldo Rivera as Jeb Bush wins his second term as President. Kurt and Blaine move back to New York and five years later, we find they are theatre actors (co-starring in the first gay production of Who’s Afraid of Virginia Woolf). They also visit schools and spread messages of acceptance and equality to young children. Rachel sings a farewell song (written by Darren Criss) as she leaves McKinley. Five years later, we find Artie and Tina as a couple in New York. Tina starred in a film that Artie directed/wrote that’s to premiere at the Slamdance Film Festival. On the way to Rachel’s home in New York, they meet successful singing artist Mercedes (she’s still single and Sam is still calling her) and couple Kurt and Blaine. Rachel is very pregnant with Kurt and Blaine’s child as their surrogate and is getting ready to attend the Tony Awards as a nominee. She’s accompanied by her very supportive husband and director, Jesse St. James. Will and his family and several former classmates watch in Ohio as she wins her first Tony. Rachel thanks her dads, her friends, NYADA dean Carmen Tibideaux for letting her back into school, and most of all Will Schuester. As Will tears up, someone on his left hands him a tissue. The camera pulls back and we see that it’s Sue. Sometime later, Vice President Sue gives a speech at McKinley High’s auditorium and rededicates the auditorium in Finn Hudson’s name. In her speech, she recalls her early opinions of the school’s glee club and admits how wrong she was. Will, Emma, Terri (? ), Burt, Carole, and Figgins sit in the audience. Many students from the past come out on stage and sing a final song. 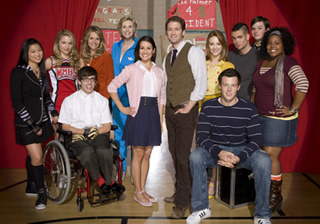 They include Rachel, Kurt, Blaine, Mercedes, Artie, Tina, Brittany, Santana, Sam, Quinn, Puck, Mike, Kitty, Jake, Ryder, Unique, Karofsky, Lauren, Roderick, Joe, Sugar, Mason, Alistair, Becky, Jane, Spencer, and Matt (from the first season). They are joined by the adults in the audience. First aired: March 20, 2015. What do you think? Do you like the Glee TV show? Do you think it should have ended or continued for a seventh season? Glee: Final Season to Have 22 Episodes? Glee: Will Massive Cast Departures Save or Sink the TV Series? Glee: FOX TV Series Renewed for Season Three Already! Glee: FOX Renews Show for Season Two, Want to Be In It? And now Grant Gustin is The Flash and Melissa Benoist is Supergirl. “It STARTED out as a great show for kids to watch, now you can’t let the kids near it” Except not it has been rated PG 13 since the first episode. If anything it sadly toned down its dark humor for the tweens. and why would you say that kids shouldn’t watch? because it speaks the truth and tackles the social issues you refuse to? I love the Tv Shows Glee! Please don’t be Cancelled at all! I will be Sad! I hear the new nice Christian girl is going to go after Kurt next season. Hope it doesn’t encourage more gay bashing. Please, please – if you’re looking for balance, remember this show is it already. great show, love it, great for kids to watch. please keep it going.